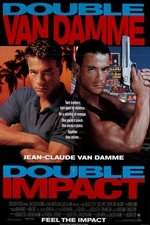 Double Impact is a 1991 American action film written and directed by Sheldon Lettich, and written, produced by and starring Jean-Claude Van Damme in a dual role as Chad and Alex Wagner. The film was released in the United States on August 9, 1991. The film marked Van Damme's second collaboration with Bolo Yeung (the first being Bloodsport in 1988).